How will Sombra impact the competitive Overwatch meta? A first look at the battle to come. Somba is Overwatch's 23rd character, an offensive hero whose job is to disrupt the enemy team’s backline. In this article, we're going to take a look at her potential to impact Overwatch at the competitive level. Sombra wields an SMG that holds 60 rounds per clip. At a fire rate of 20 rounds per second she can spray for three full seconds. I haven’t found out how much her damage fall off is but at close range she deals eight damage per hit, resulting in a theoretical damage per second of 160 (excluding headshots). The spread, however, is massive—so you need to get close and personal. Her passive ability allows her to see enemies below 50% health through walls. That makes her deadly considering her high mobility. To understand just how mobile she is, however, we need to take a look at the rest of her kit. Her first ability is called Hack and she can “hack” enemy players, enemy turrets and health packs. When she hacks a player she disables that player’s abilities (except passive abilities) for six seconds. That’s a lot in a game like Overwatch. That’s half a second longer than Ana’s sleep dart, for instance. When she hacks a turret it’s disabled for ten seconds, forcing Torbjörn to build a new turret at his current location if he wants to help his team in the fight. A hacked health pack can only be used by players on Sombra’s team and they spawn three times faster for a full minute. This one is big. Let’s take the 200 health pack next to the first chokepoint on Dorado when you’re on attack as an example. If you hack that one you can poke Reinhardt’s shield a lot more than you previously could. Low on health? No problem. 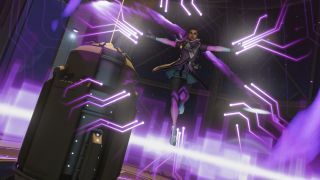 I don’t think Sombra will run around and hack health packs all over the place all the time, but on certain parts of maps it’ll be extremely powerful. Blizzard told us a little more about Sombra's design when we interviewed them at BlizzCon. Her next ability is Thermoptic Camo which grants her invisibility and increased movement speed for six seconds with a six second cooldown. Attacking or using abilities (except Translocator, which we’ll get to in a second) makes her visible again. You can still hear her footsteps so in competitive play it won’t be that much of an advantage for her to be invisible—except when she wants to flank and is far enough away from the enemy that they can’t hear her. Then we have Translocator, by far the most important of her abilities. You can place it on the map and for the next 15 seconds you can instantly teleport back to it whenever you want to. It’s basically a get out of jail free card. If you were invisible when you initiated the attack they can only guess where you teleported back to. It’s also possible to teleport to it while it’s still in mid air after you’ve thrown it, allowing for really cool plays. A neat trick that can be good to know is that you can place it on top of one of the health packs you hacked earlier to get back and instantly heal up to full health. Lastly we have her ultimate ability: EMP. It’s an area of effect ability that disables barriers (Reinhardt, Winston and Zarya), shields (Lucio’s ultimate, three quarters of Zenyatta's effective health) and hacks all enemies caught in it for six seconds. Needless to say it’s a really strong ultimate. Combined with her translocator and/or invisibility it shouldn’t be too hard to land, either. This is where I can see Sombra being a bit over powered. Not the ultimate itself:i t’s in many ways weaker than Reinhardt’s Earthshatter. The problem is how easy it is to use. One thing we need to consider, however, is that she doesn’t have a high damage ultimate like the other offense heroes. Sombra’s EMP will make Lucio’s ultimate a lot weaker. I still think he’ll be used in most hero compositions, though. His speed boost for initiating fights is too good to turn down. But I do think Mercy will be played a lot more as a result of EMP cancelling out Sound Barrier. Right now I don’t know if Zenyatta’s Transcendence gets cancelled, but even if it does a well placed Ana grenade will take care of that problem. EMP won’t cancel Ana’s Nano Boost once it’s applied, so that’ll probably be pretty important. A Nano Boosted Reinhardt can potentially buy enough time for his team to get into favorable positions and wait out the “hack”, provided that the other team doesn’t have an Earthshatter available. As for hero compositions in the new meta, it's hard to tell. One hero that comes to mind is Pharah. A Pharah/Mercy combo can stay away from Sombra’s EMP if they’re high up in the air. If you use Zarya’s Graviton Surge to initiate a fight and EMP to hack the now lumped-up group of enemies, then Pharah’s Barrage will be really powerful. Even if the other team’s Sombra hacks your Pharah (or you wish to save your ultimate) you still have her splash damage to finish off any players caught in the Graviton Surge. Only time will tell how teams will deal with Sombra if she ends up being a popular pick. It's worth noting that Ana can still heal even if she gets hacked, so she’ll probably be even more important than she’s been in the past. What’s certain is that if one team runs Sombra, the other team will have to do the same or find themselves losing control over the map's health packs. Sombra’s biggest impact will probably be that she adds a layer of paranoia to the game: protecting your backline has never been as important as it will be when she arrives.